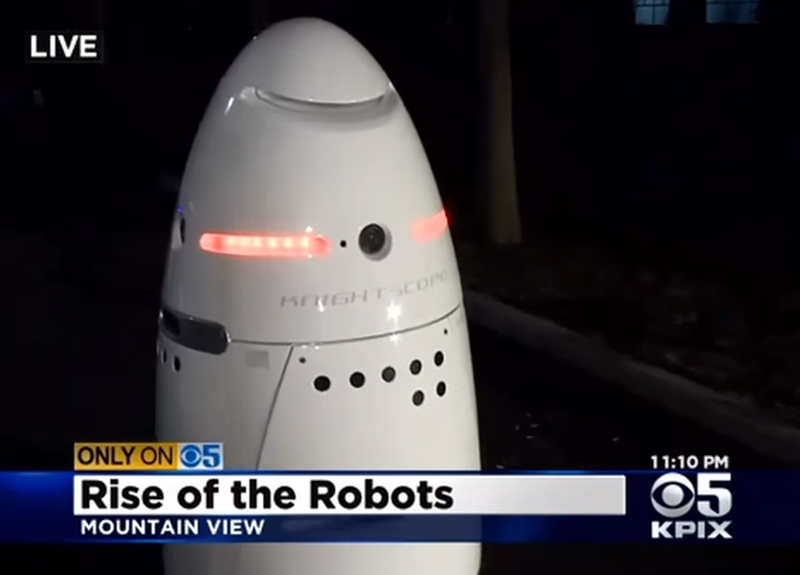 New security robots are patrolling the streets of Silicon Valley, California. Soon, these 300-pound, five-foot tall robocops are expected to be everywhere. These futuristic-looking robots are called the Knightscope K5 Autonomous Data Machines. They were designed by Knightscope, a robotics company located in Mountain View, California. The K5s have no firepower, but they possess rudimentary artificial intelligence, can videotape suspects and their vehicles, alert the authorities and track suspicious activities in progress. The K5 robots are equipped with microphones, speakers, cameras, laser scanners and sensors, as well as a laser navigation guide and an SOS alarm system that alerts the control center if anyone tries to tamper with the machine. These sophisticated robots have the ability to detect heat and odor. They can also detect the sounds of breaking glass or other loud sounds that might be associated with home burglaries or business break-ins. The K5’s camera can recall up to 300 number license plates a minute, while monitoring traffic. Each K5 contains a battery that runs for 24 hours. When the power supply gets low, the robot will travel to the nearest charging station and plug itself in. K5 robots can fully re-charge their batteries in 15 to 20 minutes. If a person steps in front of the K5 robot, it will stop and move around the person, simultaneously recording its surroundings and sending a video to the control center. A button located on the top of the robot’s “head” can be pressed by anyone who needs help. These quiet robocops are designed to be autonomous, operating practically without human involvement. K5’s will neither chase people down, nor will they avoid tense situations. More of these robots will be deployed towards the end of 2014 to patrol malls, college campuses and businesses.